The recipe is also versatile. You can use low-fat or fat-free dairy and substitute whatever sweetener you prefer. If you don’t mind adding a few carbs, you can add some delightful berries as a garnish. Hope you enjoy this as much as I have! Let three 8 oz packages of light cream cheese sit out to soften for about 20 to 30 minutes. Softening in the microwave can be tricky and could result in undesirable outcomes for the recipe. Place all ingredients in a mixing bowl. Beat with an electric mixer until smooth, approximately 2 or 3 minutes on medium. Spray an 8″ x 8″ glass baking dish with olive oil. 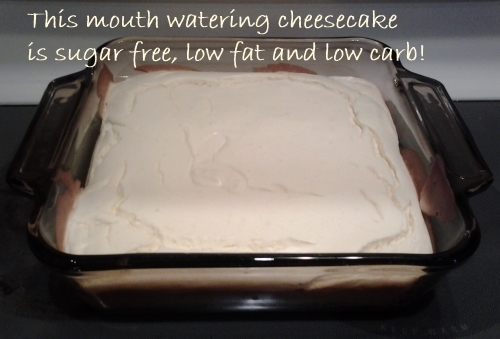 Scrape the cheesecake mixture into the baking dish, and bake in the preheated oven for 25 minutes. Turn off the oven, then leave the cheesecake in the oven for an additional 25 minutes. 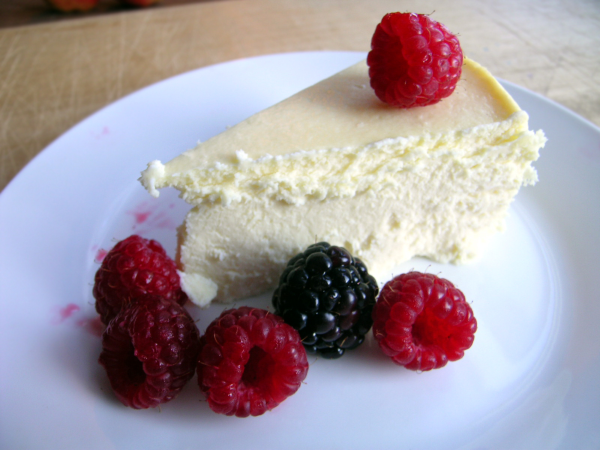 Remove your cheesecake from the oven, allow to cool slightly and serve with light whipped topping or fat-free whipped cream. 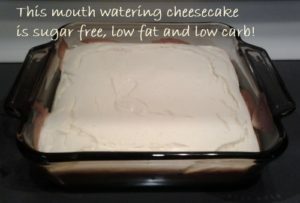 If you want, you can substitute fat-free cream cheese for one of the three packages without significantly affecting the cheesecake’s taste. You won’t notice the lack of crust on this cheesecake, or the sugar and extra fat that’s missing. Store leftovers (if there are any) in the fridge for up to a week.